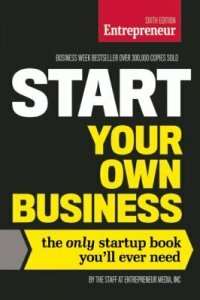 Revised edition of Start your own business : the only startup book you'll ever need, 5th ed., published in 2010. Think. Introduction ; Taking the plunge: get ready to be an entrepreneur ; Good idea! : how to get an idea for your business ; Good timing: should you launch your business part or full time? ; Build it or buy it? : starting a business vs. buying one -- Plan. Choose your target: defining your market ; If you build it, will they come? : conducting market research ; The name game: naming your business ; Make it legal: choosing a business structure ; Plan of attack: creating a winning business plan ; Call in the pros: hiring a lawyer and an accountant -- Fund. All in the family: financing starts with yourself and friends and relatives ; Nothing ventured, nothing gained: how to find and attract investors ; Looking for loans: th ins and outs of debt financing ; Fed funds: how to get government loans -- Prepare. What's your deal? : negotiating successfully by Cliff Ennico ; Site seeking: choosing a location for your business ; Looking good: creating a professional image ; Stock answers: the lowdown on inventory ; It's in the mail: setting up mailing systems ; Charging ahead: offering your customers credit ; Cover your assets: getting business insurance ; Staff smarts: hiring employees ; Perk up: setting employee policies and benefits -- Buy. Buyer's guide: business equipment basics ; Business 24/7: using technology to boost your productivity ; Net works: building your company website ; Keep in touch: using technology to stay connected -- Go. Brand aid: building a brand ; Marketing genius: advertising and marketing your business ; Talking points: how to promote your business ; Sell it! : effective selling techniques ; Now serving: offering superior customer service -- Engage. Net sales: online advertising and marketing ; Social studies: social media marketing ; Can you relate? : social media networking -- Profit. Keeping score: the basics of bookkeeping by J. Tol Broome Jr. ; Making a statement: how to create financial statements by J. Tol Broome Jr. ; On the money: effectively managing your finances by J. Tol Broome Jr. ; Pay day: how to pay yourself ; Tax talk: what you need to know about your taxes by Joan Szabo -- Appendix: business and government resources. Description: vii, 720 pages : illustrations ; 23 cm.